?What is causing pain on top of my teen’s foot? ?How does compression help an injury? Recovery and rehabilitation is often the scariest and most difficult aspect of the ankle surgery process for many people, or at least the part they’re looking forward to the least. To be honest, your surgery recovery will take time. You’ll probably get frustrated from time to time because you’re sick of not being able to walk normally, or wear normal shoes, or not feeling quite like yourself. But don’t give up! We promise that it’ll be worth it. We want to demystify the recovery process for you, so read on for a general overview of what you can expect. Keep in mind, exact numbers and procedure may vary on a case-by-case basis. What are the primary stages of recovery? In the beginning days after surgery, the primary focuses are on rest, healing, minimizing pain and swelling, and protecting the ankle. You will probably need a cast immobilize the area for at least 2 weeks, and it will be important to keep the cast and stitches dry. Eventually, when your doctor says you are ready, you will likely switch to a removable walking boot to allow some moderate weight bearing activity. Slowly, as your pain and swelling allow, you’ll be able to gradually increase the amount of weight bearing activity you perform, and can begin a program of stretches and physical therapy to rehabilitate the ankle. This will help restore lost strength and range of motion, helping you gain firmer footing and prevent future injuries. How long will it take? Depends on the injury, the surgical procedure, your health status, how closely you follow post-operative instructions, and other factors. For many injuries and procedures, a typical timeline would be about 6-8 weeks for the bones to heal, and a little longer for ligaments. Most people can return to normal daily activities in about 3-4 months, although it may take a year or two to really feel like you’ve fully returned to your previous levels of strength and flexibility. 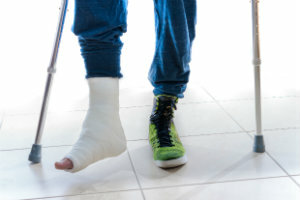 While no one enjoys a lengthy time out of action, ankle surgery offers a way for patients with either traumatic or chronic ankle problems to regain their quality of life, and the recovery period is a critically important part of that process. For help with your foot or ankle problems, call Dr. Harvey Danciger in Palm Desert, CA at 760-568-0108.